Aliens are have crash landed in the middle of the desert and are assaulting your diner! Grab your short shorts and Tommy guns and give them an all you can eat buffet of lead! There is no actual story to speak of written anywhere. All that is given is a premise, though much can be inferred from the premise and the area. There has been a crash in the desert near the diner, and it is no ordinary crashed plane, but an alien space ship. 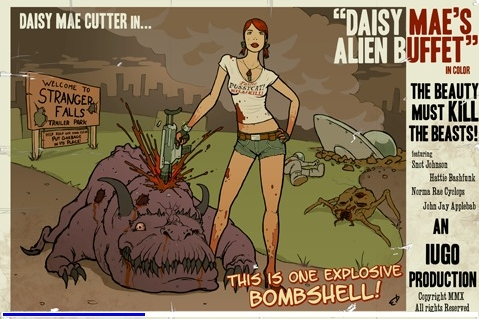 Now there are hordes of aliens that are attacking Daisy and you must fend them off with any means disposable. There is nothing amazing about the graphics for this game when compared to other consoles. However this is a 3D game and is played from a top down perspective and for the Iphone the graphics are quite amazing with well designed aliens and a well designed environment. The main character, Daisy Mae, is designed interestingly enough with her original clothing, and is given a selection of unlockable outfits to wear after enough playtimes. Her character looks great with only some minor polygons being out of place, while the rest of the game is quite smooth looking. There is a large variety of aliens to be afraid of and each is designed quite uniquely with nothing copied between them. There are two small creatures that travel quickly, but are only harmless if they touch you, and then there is a humongous blob like alien that can destroy you as long as it can get close to you. There is only one level in itself, but the level is gigantic and you can traverse anywhere along the map, except not inside buildings which could have provided a bit of interesting gameplay from fighting inside a building instead of always outside. There are many various environmental obstacles that you can use to your benefit to help funnel the aliens in a smaller path so that they can not easily surround you which provides a bit of strategy. As you start the game, you are given the choice between three modes to control Daisy. One such mode is automatic shoot where you only use one joystick to move around and Daisy shoots at anything that moves near you. The other two modes require the use of both hands to control. Button Shoot involves the use of movement with the left stick, and a button that shoots bullets when pressed. And finally there is a third option given called Dual-Stick, involving he use of one stick to move, and the other stick to aim the guns and where they shoot. Then the game provides a medley of different weapons to put down the aliens that are attacking you. You start with your basic dual Tommy Guns, however there are many more to acquire. These are acquired by killing the aliens and occasionally, one will drop a weapon upgrade. These weapons include everything from a ninja-star launcher, a rocket launcher, to a ray gun. Not only is there the usual weaponry to bring down the pain, there is also a womanly side to Daisy Mae. As the bodies pile up Daisy Mae’s taunt gauge fills up. The taunt is a devastating move that can clear the area all around you with one push of the button. The further the gauge fills up the higher the range of the attack, with a full gauge the entire screen can be wiped of enemies. Not only this but the health bar is shown as 3 kiss imprints in the top corner. As you get hit by the aliens you will lose one kiss and can only take three hits before it is Game Over. Though your health can be refilled by picking up lipstick that is dropped from the aliens much like the gun upgrades are. The only complaint that I have about gameplay is that it suffers from stagnancy because there is only one level. If there was a variety of levels provided then the game would have much more replay value and allow the player to see possibly even more of the great level design. This game is quite enjoyable and even though there is only one level to play on and no story to speak of, the gameplay speaks for itself. The variety of enemies and the weapons that you can use against them are quite wonderful.